This historic three-story Victorian Italianate style building was brought to life in 1889 and was one of the first hotels built from the ashes after the city’s famous Great Seattle fire earlier that year. Designed by James W. Hetherington and Clements as part of the Wittler Block, it was featured in what was Seattle’s original commercial district. It opened in 1890, as the Elliott House. From 1891 to 1904, it converted Derig Hotel with 56 rooms and for a very short time was also known as the Star Lodge. 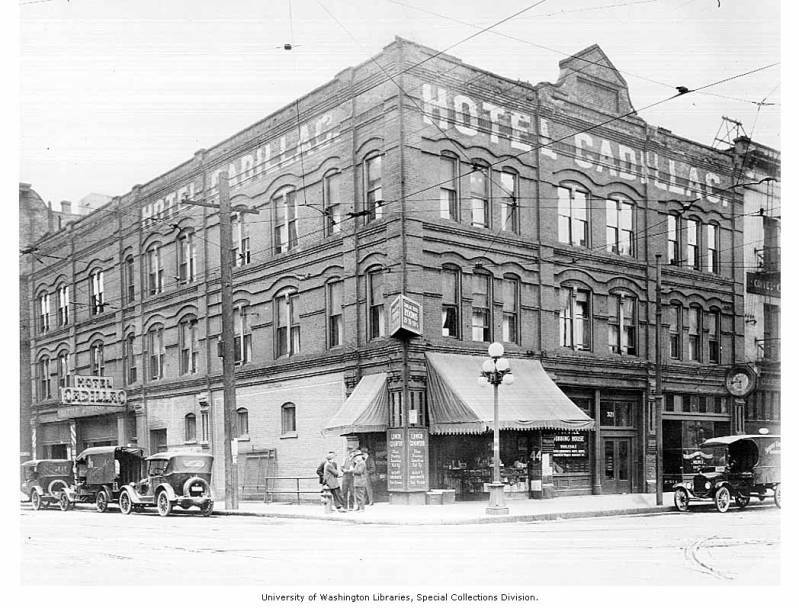 By 1906, under new ownership it became The Cadillac Hotel highlighting 59 available rooms. The building had always catered to loggers, fishermen, railroad and shipyard workers employed within the area. In fact, during most of its long run, it served as a workmen’s hotel for young single men and offered cheap rooms at 25 to 50 cents a night. With its front side of the building running along 2nd Ave, the first floor operated a number of businesses on the street level including a lunch counter, a bar, a drugstore and various inexpensive restaurants. By the late 1930’s, Pioneer Square fell into despair as more and more of the area’s historic buildings became rundown and abandoned. Most of its businesses and residents moved to the newer and more developed locations, which are now collectively known as Downtown. Keep in mind this was also before the region became the historic district we know today. In 1970, the hotels and apartment buildings in the area took a drastic turn of events when on March 20th an arsonist set two fires at the Ozark Hotel that took over twenty lives. This tragic Seattle incident inspired the Ozark Ordinance, which made it mandatory for all hotels and apartment buildings to install sprinkler systems on upper floors. Unfortunately, most of these establishments within Pioneer Square were already in financial trouble and couldn’t afford the high costs of installing them. This hardship caused many locations to either shut down completely or close off their upper floors. This is exactly what transpired at the Cadillac Hotel as it permanently shut down the hotel portion, leaving just the main floor open for small businesses. For more then 30 years, nothing but the deserted remains of furniture, half made up beds, clothes still hung in the closets and other personal objects of past lodgers rotted away in the uninhibited rooms. This endured until another tragic event would strike the hotel in 2001. 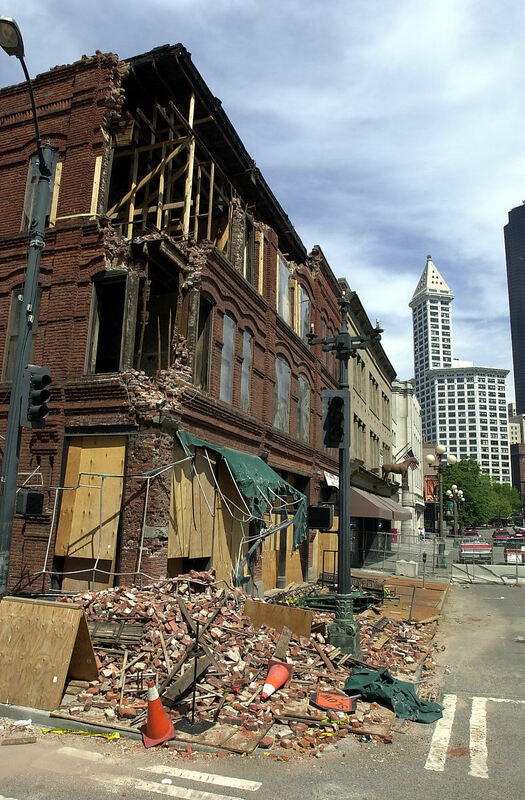 On February 28, a 6.8 magnitude earthquake known as the Nisqually Earthquake shook this old building almost to death. The results of the earthquake caused such an extreme amount of damage with the brick facade toppling to the sidewalk and onto parked cars, that the owner, fearful that the rest of the building was soon to follow, applied for a permit to have the building demolished on March 9th. However, many believed that the structure still had some life in her and could be saved, so the permits were denied. Right away work begun in search of how they could save the beloved landmark. 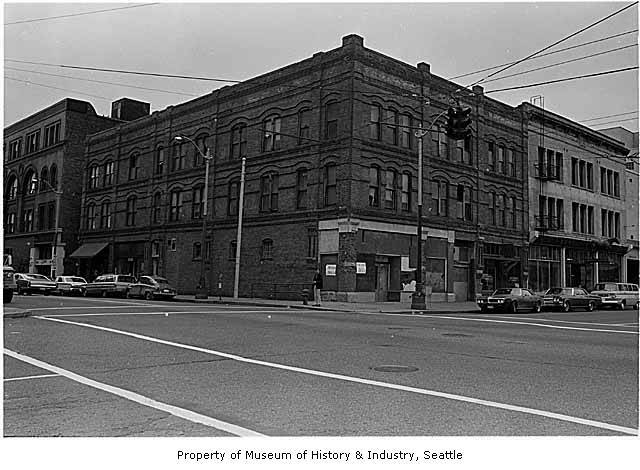 The Cadillac’s heroes would be named Historic Seattle, a preservation organization founded in 1974 shortly after the Pioneer Square neighborhood was saved as a historic district with work to clean it up and preserve it. 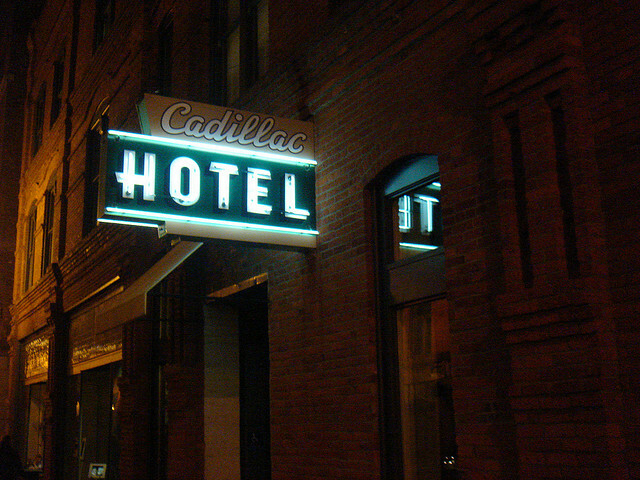 The organization obtained a $2.04 million Section 108 Loan to purchase the Cadillac Hotel from the City of Seattle Office of Economic Development. Evicting its last resident, the Phoenix Underground, which operated as a popular nightclub in the basement, renovations to restore the Cadillac started in 2001 and ended in 2005. When the doors opened once again, the building functioned as a museum ran by the National Parks Service as the Klondike Gold Rush Museum. In fact, the building itself is listed in the National Park System as Washington’s smallest park, known as the Klondike Gold Rush National Historical Park. Then museum offers free admission and tells the story of Seattle’s most important part of the city’s history. Today, the Cadillac stands strong reflecting its past inside and out. Nonetheless, with such history follows a few hauntings as well. Stories of apparitions wondering the upper offices, a strange sound here and there, even a strange ghostly presence felt in the elevator. These don’t compare to the sad tale of hearing a woman and her child crying late into the night. As to who she might be, many believe she is a single mother who took her and her child’s life after being evicted during hard times. Some say she was a prostitute who may have performed her own abortion and bled to death in her room. Whoever this sobbing entity might be, her sadness still echoes through the halls of a past newly restored.